Vicinity Location: The trailhead is about 52 miles southeast of Portland, Oregon in the Mt. Hood National Forest. Directions: From Portland take I-84 East to the Wood Village, exit (16A). Head south and turn left onto NE Burnside Rd. Heading East, Burnside will merge into Highway 26. Follow Hwy 26 past Government Camp and exit on Highway 35 to Hood River. Continue onto Highway 35 North for 6.4 miles then take the exit toward Mt. Hood Meadows Ski Resort/Bennett Pass Sno-Park. 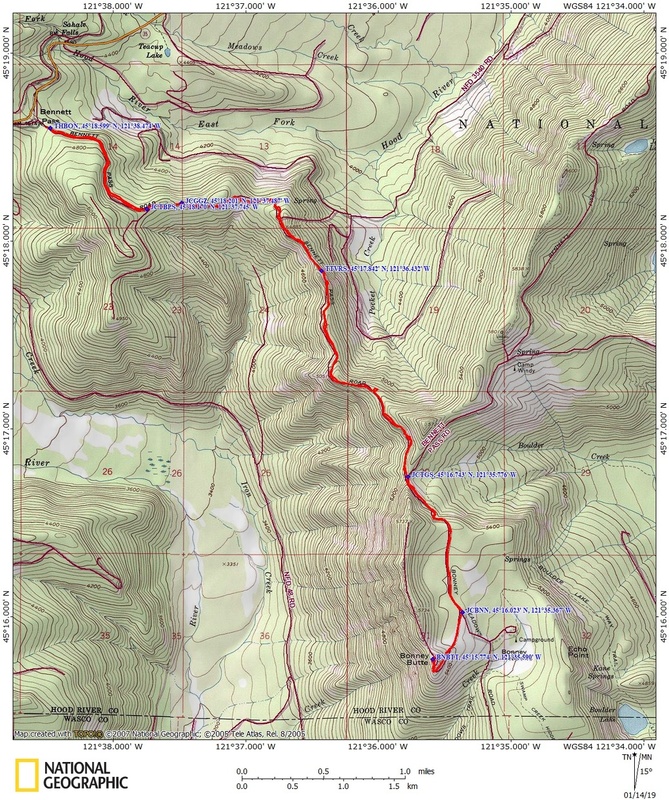 After about 0.3 mile, turn right onto Bennett Pass Rd/NF-3550 and the sno-park parking area. If you cross over Highway 35 then you have gone too far. In winter, it is required to carry chains or have traction devices. There are pit toilets at the trailhead. A current Sno-Park permit is required to be displayed between November 1 and April 30. Oregon permits cost $4 a day, $9 for three days or $25 for the season. The permits can be bought in Government Camp other outdoor stores or DMV offices. Total: Length 11.5 miles, total ascent 1,610 feet, total descent 1,610 feet. Lowest elevation: 4,730 feet. Highest elevation: 5,581 feet. This trail is a forest road in the summer but winter snows and wandering snowshoers take multiple side-trails which make finding the correct route difficult without GPS or using good map and compass skills. If you are not able to follow some kind of map and navigation skills then do not attempt this snowshoe trip. Snow-mobiles also use this trail as long as they can navigate the Terrible Traverse. This trail is also popular with skiers. From the parking lot follow the most obvious trail heading generally east and southeast as you gently climb through the old second growth forest. A ridge slopes up to the right for the first 0.9 miles where you keep left at the first main junction. From here on the Badger Creek Wilderness boundary is just on your right. After passing a couple of lovely viewpoints of Mount Hood and the Hood River Valley you come to the Terrible Traverse. This is a rock cut blasted blasted into the steep side of a ridge. Here the views are to the North and the rock face is mostly to your right. There have been people caught in avalanches at the Terrible Traverse. Other people have tried to avoid this traverse by going up over the spine of the ridge but that is even worse. If there is anything above moderate avalanche danger you should stop, turn around here, and wait for another day. I have planned this carefully when there had been no new snow for several days and the day before had been sunny and warm to release most of the avalanches. On the day of this hike it was sunny and breezy which means the wind could cause some snow loaded slabs to accumulate. Looking at the Terrible Traverse I didn’t see any dangerous snow conditions. After negotiating the Terrible Traverse the trail passes through a rock-toothed gap and then drops down back into the forest. This next part is mostly in the forest with a few views.to the north if you climb up to the ridgeline just on your left. The trail rises gently then after you start paralleling Bonney Butte it drops down through a wide Gap in the tall hemlock trees to a junction to Bonney Butte. This last section to the Bonney Butte Junction is almost due South and around noon the sun shines directly down the trail creating a bright avenue of trees. Turn right to take the gated forest road up to Bonney Butte. Heavy snowpacks may cover the gate. On the short walk up to Bonney Butte you break out of the trees and have great views into Eastern Oregon. Curving around to the top of the butte, there are nice views of Mt. Jefferson and other distant peaks. Up on the top of the butte there are fantastic views of Mt. Hood and nice views of Mt. Adams. Return back the way you came. This trail is one of those that has uphill sections both ways. On the return trip the uphill sections aren’t very long or very steep.